- 100% Waterproof: Strong Transparent PVC cover, UV protection. OVERLONG COVER design makes greenhouse more airtight and secure. - ADJUSTABLE HEIGHT: Removable shelves, Adjust the height according to your needs, you can choose to install all the shelves or some. 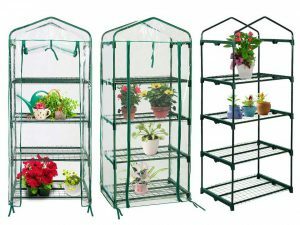 - HIGH QUALITY: heavy duty durable powder coated steel framework, Transparent PVC cover with double front zips for easy access and ventilation. - WIDESPREAD USE: Indoor & Outdoor, with cover & without cover. Easy to set up. Portable to move. - HIGH STANDARD: ISO 9001:2000 standard certified manufacturer.